Living history museums are a popular destination for visitors seeking a unique connection to the past often left out of history books. But Toronto's Black Creek Pioneer Village takes this connection to a whole new level. "There are a lot of living history museums, but we take it a step further," explains Assistant General Manager Wendy Rowney. "People want to become involved, and we invite visitors to try out the activities. 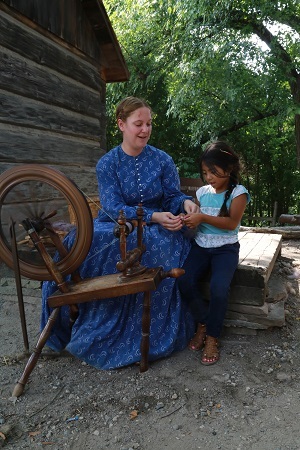 Try out a period craft, try on the clothes, feel what it was like to move as a person in the nineteenth century." Black Creek recreates a Canadian frontier village in the 1860s, offering visitors the chance to step back and time and experience Ontario's rich cultural heritage in a uniquely interactive way. Visitors can explore the carefully-maintained heritage buildings and gardens that make up the village, interact with costumed historical actors, and try out historical crafts such as blacksmithing, baking, weaving, and printing. Visitors to Black Creek can expect to find surprises in each of the historic houses, and even the most knowledgeable history buff may learn to look at the nineteenth century from a new perspective. "Many people have preconceived notions of what nineteenth-century life was like and what a pioneer looked like," Rowney says. "But Toronto was a city in the 1860s--there were roads and trains, people were importing and exporting goods all over the world. Society was a lot more complex than people assume. We want people to challenge their own ideas, to feel and make connections with people who were living in the time period." Given the amount of visitor participation, Black Creek's historical trades are the thing that most set it apart from other history museums. "Oddly enough, the printing press is one of the most popular trades," Rowney says. "Today, we're always typing. We're surrounded by fonts and type--we're typing constantly and always communicating with the written word. But the magic of lifting up their work off of the press and seeing how beautiful it is--that never fails to surprise them. Graphic designers in the nineteenth century took pride in laying out the fonts and making everything look nice, just like we do today." At Black Creek, the year is 1867, right at the cusp of the formation of Canada's confederation. As Rowney points out, this provides the museum with an opportunity to celebrate Canada 150 in a unique way. "We're looking at what life was like right at the time when Canada was becoming a country," she explains. "We explore what was important to them, what their politicians were arguing about, what young people were thinking their future held for them." Black Creek is a vivid demonstration of the surprising similarities between people in the modern world and their nineteenth-century counterparts, providing visitors with a profound human connection to the past. "I love learning about the real people here," Rowney says. "And it's amazing to see people's faces when they make connections between the past and present. People of all ages, when they're trying one of the crafts, they realize how these ordinary people lived."